Need a Father’s Day recipe? 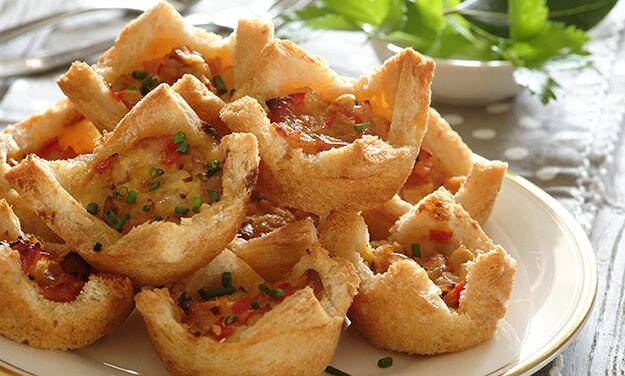 Try this Bread Basket Quiche recipe for a savoury baked treat today. Stork – Love to Bake. Cut the crusts off the bread and trim squares to fit your patty pans tray with the corners protruding above the pan. Butter the bread and place it in the pans with the buttered side down. Fry the onion and bacon in a little Stork Bake margarine until soft. Beat the egg and milk together then add the onion, bacon and cheese. Spoon equal amounts into the bread baskets and bake at 180ºC for about 10 - 15 minutes until golden brown.